JohnnyTwoToes reviews the biggest bomb of 2013! I know this is coming late, but better late than never. Gore Verbinski is a man that can direct the Pirates Of The Caribbean films which are not awful. The first two were enjoyable if nothing ground breaking. The third part 'The World's End' I dubbed 'At Wit's End' for the shear fact that it was so awful and bone crushingly dull I could not bring myself to watch the last one, at all. Verbinski's best film is 'The Weather Man' with Nicolas Cage as a local meteorologist whose career is about to take off, but whose home life is utter ruin. It was a quiet, well written and directed film and exceedingly well acted so it was on my list of 10 best in 2005. The Lone Ranger has come and gone. A critical and commercial bomb that has the studio (Walt Disney) losing an estimated 175 million dollars. At least, that is what my sources tell me, anyway. It might make back its money with DVD sales and overseas sales but it will take a while. Verbinski and Johnny Depp who plays Tonto have gone after critics saying it was, "Their Fault" the film was such a bomb. Could it be the film was a stinker because......oh, I don't know........it stunk? I am just guessing. 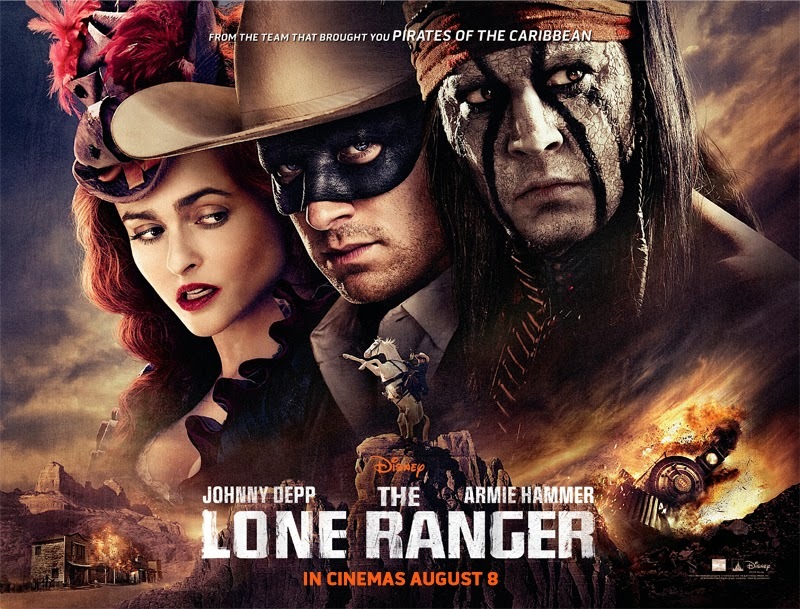 Is The Lone Ranger as bad as everyone said it was? No. Is it a misunderstood classic? Helllllll, NO. The Lone Ranger is a perfect example of how NOT to make a big budget extravaganza. With a 225-250 million dollar budget one has to wonder where all the money went. Simply put, The Lone Ranger is an overstuffed and overblown film that suffers, for me, because of the miscasting of Armie Hammer as John Reid (AKA The Lone Ranger). His presence on screen pales in comparison to just about everyone else on screen and for The Lone Ranger to work he has to be a strong character, not a mousy waif. In this version, Reid and Tonto are battling Butch Cavendish (William Fichtner) but for added monotony they also are battling the corrupt Latham Cole (Tom Wilkinson). There is the added characters of Reid's slain brother's wife that has a fondness for John Reid but the film does not deal much with it and the only real enjoyable character that seems to be having fun is Helena Bonham Carter's local Cathouse custodian named Red Harrington. If I was going to recast this film, I would not hesitate to have cast Johnny Depp as John Reid. He has gravitas and depth that Mr. Hammer does not have. The villains are pretty much your standard bad guys as they snarl and spit their way through two and a half hours of bland dialogue, mundane shootouts and some rather unfunny comedy. For the millions of dollars pumped into the budget, there could have been a lot more effort put into the script which has been penned by Ted Elliot, Terry Rossio and Justin Haythe. There should have been more rewrites for the script because what the viewer is left with is a film that is all style and no substance. The Lone Ranger suffers from just too much hype and too much effort into the look of the film rather than a compelling story and a roguish title character. Depp is merely doing a different variation of his Jack Sparrow character from the 'Pirates' films. This is the kind of 'bad' film people can enjoy if you want to swill booze and make fun of it but due to its bloated length the viewers might pass out before they make to the predictable end. Still, The Lone Ranger looks great with its cinematography by Bojan Bazelli making good use of the locales and Hans Zimmer's score is a a terrific mixture of electronics, percussion, western guitar and orchestral arrangements that flow very well together.